Want to watch the England v Czech Republic European Championship qualifying match outside the UK? We’ve got the details you need. 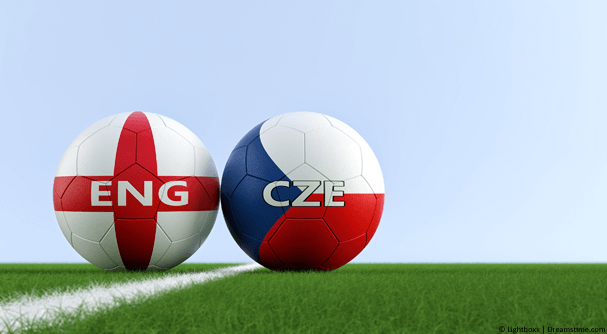 England face the Czech Republic (or Czechia as they’re apparently also known?!) this Friday in the qualifying match for the Euro 2020 tournament. Qualification is almost as important as the tournament itself as we all know how it feels to have a team miss a significant football tournament (see England’s 1994 World Cup and their 2008 European Championship qualification failure). Czech international Matej Vydra has identified the England back line as the weak link. While he admitted England’s attack of Kane, Rashford and Sterling was one to watch, he’ll undoubtedly be toying with Maguire. Maguire will be extra careful after being shown a red card in the recent club meeting between the two players in the Burley v Leicester game. So with qualification games holding as much weight as any other, it’s likely you’ll want to tune in. However, unlike the main European Championship itself, finding a reliable stream of the match when you’re abroad can be difficult. In this guide I’ll be showing you the best way to watch England v Czech Republic in their qualification match outside the UK. You don’t need to miss a second of the action. The match is being shown live by ITV, but obviously, if you’re outside the UK you won’t be able to get access to a TV showing ITV. There’s also ITV’s online streaming service, ITV Hub. This will also show the England match live but again, if you’re outside the UK, you’ll find yourself blocked from watching. The service uses geo-restrictions to make it available for viewing only in the UK. The solution is an app called a ‘VPN‘. A VPN allows you to change your online location so you can hop over any geo-restrictions and live stream the entire England v Czech Republic match in any country. There are loads of different VPN services, although my favourite is ExpressVPN. They’re fast which is important so you don’t suffer buffering and they’re beginner-friendly so take just a few minutes to set up. There are some other good options too so pick any of these three and sign up. ExpressVPN – Recommended, Easy to set up and use. Once you’ve decided on which you’re going to use, follow the steps below to watch England take on the Czech Republic. Choose one of the three recommended VPN services above. In this example I’m using ExpressVPN, sign up for their service over at their website. It’s 49% cheaper to take their annual package which is great for watching future matches, other sport and more TV abroad. Once you’ve signed up for ExpressVPN (or one of the other VPN services), you’ll need to download their app. For ExpressVPN you can get their mobile app from your regular app store, search ‘ExpressVPN’ and install from there. If you’re using a desktop or laptop, then download the ExpressVPN app from the ‘Products’ section of their website and install. Open the newly installed VPN app and login with your account details. These are the same details you created when you signed up for the service. If you’re using a Windows or Mac computer, then you’ll need to use the activation code which you can find in the ‘My Account’ section of the ExpressVPN website. Now you’re logged in press on the ‘Choose Location‘ (1) button and then press ‘United Kingdom‘ (2). On the mobile apps you’ll need to press the ‘…‘ button next to ‘Selected Location‘ and then ‘United Kingdom‘. The app will either automatically connect or you may need to press the ‘Connect‘ (3) button. Watch England v Czech Republic using ExpressVPN. Time to crack open that beer. Just one step to go. Now you’re connected the ITV Hub website or app will think you’re in the UK. Open up a new web-browser and head over to the ITV Hub website where you can live stream the entire England v Czech Repubic match. Alternatively if you prefer to use the ITV Hub app then open it and enjoy watching the match. What time does England v Czech Republic kick off? The England v Czech Republic match takes place on 22nd March, 2019. Kick off is at 7:45 pm in the UK but actual coverage starts from 7 pm so you can tune in and watch all the pre-match build up if you want. If you need to work out what time that is in your time zone then use The Time Zone Converter which will tell you what time that is in any country. What countries can I watch the match in? 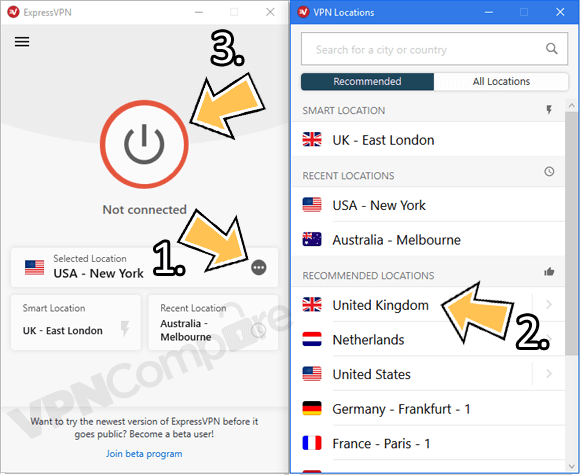 When using a VPN from ExpressVPN or one of the other recommended VPN services you can watch in any country in the world. So that means you can watch England v Czech Republic in their Euro 2020 qualifier match in America, Canada, Mexico, Brazil, Ireland, France, Germany, Spain, Turkey, South Africa, Dubai, India, Pakistan, Thailand, Japan, South Korea, Indonesia, Australia, New Zealand or anywhere else. You’re not limited to watching the game from one country but can watch anywhere in the world. England has been drawn a somewhat easy group to qualify for Euro 2020 and being ranked 5th in the world, their meeting with 44th ranked Czech Republic should, in theory, pose little threat. However, as an England supporter you’ll know nothing ever goes smoothly in football or with England so you’ll want to tune in to make sure the three lions do enough. If you’re outside the UK you’ll need to download a VPN app from ExpressVPN. This will let you unblock the ITV Hub service allowing you to watch the entire game live wherever you are in the world.